In the small intestine, crypts and villi provide the tissue with a large surface area, which increases the volume and residence time of the fluids improving its absorptive function of nutrients and drugs. This approach presents a new technology to fabricate 3D hydrogels mimicking the architecture of the small intestine. This method uses conventional photolithography to fabricate 3D microstructures with complex geometries on poly(ethylene glycol)-based hydrogels (PEGDA) in a single step and moldless approach. This new method is simple and cost-effective for producing models of intestinal epithelium that can be easily integrated into standard cell culture platforms. With this new procedure it has been demonstrated the suitability of the photolithography technique for producing 3D microstructures with complex morphologies without the need for molding and demolding steps. With this process, controlled gradient of oxygen is obtained during photopolymerization. By controlling fabrication parameters such as the oxygen diffusion/depletion timescales, the distance to the light source and the exposure dose, the dimensions and geometry of the microstructures can be well-defined. In addition, copolymerization of poly(ethylene glycol) with acrylic acid improves control of the dynamic reaction-difussion processes that govern the polymerization. 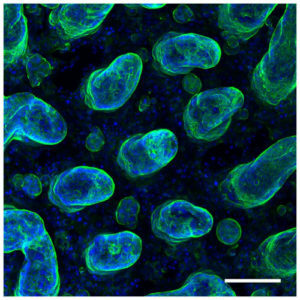 Moreover, acrylic acid allows the controlled incorporation of ligands for cell adhesion, preserving the mechanical properties of the hydrogels. Synthetic polymers such as PEGDA have advantages over natural polymers. These include adjustable mechanical properties and non-biodegradability to withstand long term cell culture conditions. By proper tuning of the polymer composition and the fabrication parameters it is possible faithfully mimic the 3D cell architecture of the small intestinal epithelium in synthetic hydrogels. Moreover, this method allows the fabrication of these hydrogels in porous membranes that adapt to the conventional cell culture plates allowing to measure standard functional properties of the intestinal cell barrier such as its integrity and permeability, by conventional methods. These results demonstrate that this moldless microfabrication technology is an easy-to-use tool that can faithfully replicate 3D microtopographies at the tissue level in hydrogels.